Ah, "A Pirate I Was Meant To Be". If you talk to fans of The Curse of Monkey Island and asked them to recall one song or tune that they remember from the game, this one would probably be it. 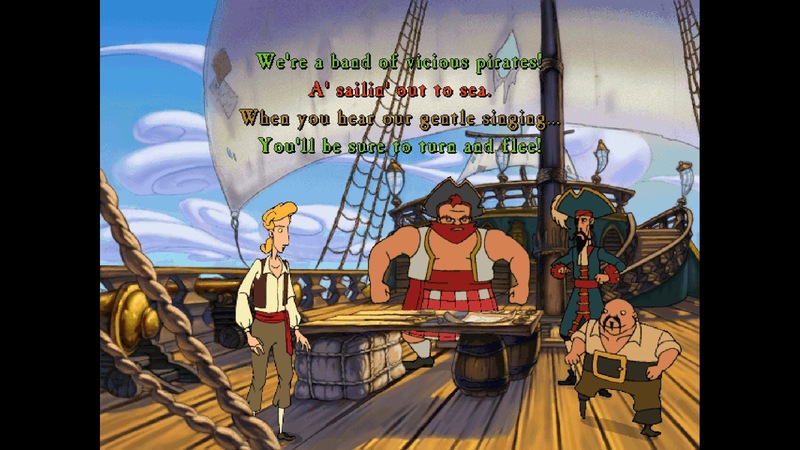 Just when you're about to order your crew to pursue Captain Rottingham they burst into song, much to Guybrush's dismay. They'll continue to keep rhyming, even incorporating Guybrush's comments into the song, until Guybrush finally figures out that there is no word that rhymes with "orange" which results in the song ending (although Guybrush does feel some remorse for spoiling his crew's fun).